Hailed as “the star of the evening” by The Philadelphia Inquirer and praised for her “sweet oboe sound” by The Washington Post, Mary Lynch has been Principal Oboist of the Seattle Symphony since 2014. She began her career as Second Oboist of The Cleveland Orchestra and has performed as a guest with the Chicago and Pittsburgh symphony orchestras, and the Norwegian Radio Orchestra. Since the start of her tenure in Seattle, she has performed frequently as soloist with the Seattle Symphony. An avid chamber musician, Lynch has spent several summers at the Marlboro Music Festival, has toured with Musicians from Marlboro, and performs regularly with the Newport Music Festival (RI) and the Seattle and Philadelphia Chamber Music Societies. Her chamber music performances have been enthusiastically reviewed and broadcast on radio stations around the U.S., including on American Public Media’s Performance Today. 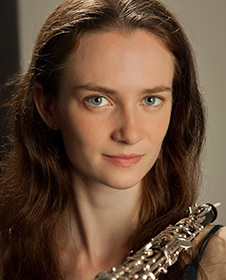 Lynch earned her BM and MM degrees at New England Conservatory and The Juilliard School respectively, studying with John Ferrillo, Elaine Douvas and Nathan Hughes. She is also a graduate of Interlochen Arts Academy, where she studied with Daniel Stolper. Now a devoted teacher herself, Lynch serves on faculty at the University of Washington.